Published by Ian in CHAPS at 11:22 pm. Skip down to comments or read the others. I hadn't seen this one before I was asked about it in one of the monthly Sigma Panel surveys. IDIDIT.org.uk is a microsite aimed at "gay or bisexual" (it uses Flash, so you can't copy text from it easily, sigh) men. "I did it for love" – fine. 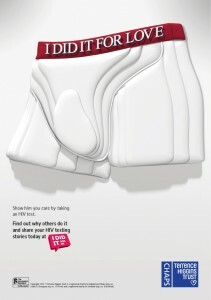 "Show him you care by taking an HIV test" – arrggghhhh!!!!! Did no-one think what message this sends to "gay and bisexual" men? It's firstly that there is one person (and just one person) and secondly that it's a man. Hello THT? Men without a partner? Men with more than one? Female partners?